Despite Florida being called the Sunshine State, there is still this misconception that solar panels do not perform well where clouds exist. It’s true that our summer days are punctuated by billowing clouds and violent thunderstorms, but several factors allow solar energy to flourish in Florida. Contrary to popular belief, solar panels continue to produce power during hazy and cloudy weather. The same way that you can get sunburned on a cloudy day, solar panels can produce power. What’s important is the amount of radiation hitting the surface of the panel, and how well the panel can turn that radiation into usable electric current. 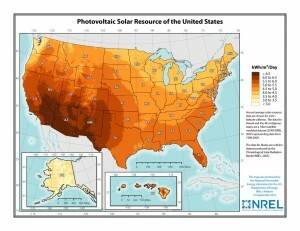 Solar Resource by State. Courtesy National Renewable Energy Labs (NREL), link. Solar panels produce the most power when the sun is directly perpendicular to their surface (all else being equal). The closer a panel is aligned to the position of the sun, the more power it will produce. We typically pitch solar panels to the south to take advantage of the best average alignment possible. The key here is the average – while we may experience cloudy weather at times, we know that there is an optimal pitch and orientation for panels based on past weather patterns. Incidentally, solar panels perform slightly better on east roofs than west in coastal western Florida because in the summer the afternoons are cloudier. Fortunately our winters are very clear with brilliant blue skies. Summers typically have good weather around mid-day when solar production is most critical. Despite clear weather, winter days are short. Despite long days, summer days have clouds. Everything balances out. In fact, our best solar month is usually April when we have spectacular weather, and days of average length. Most solar energy systems installed today are grid-interactive – they work in parallel with the utility grid. The utility grid is effectively the “battery” in a solar energy system. When we produce more energy than we need, we send it back to the grid for our neighbors to use. When we need more energy than we are producing, we buy it from the grid. This all happens seamlessly, and we only pay for the net amount of energy used. This “accounting system” of credits is called netmetering. 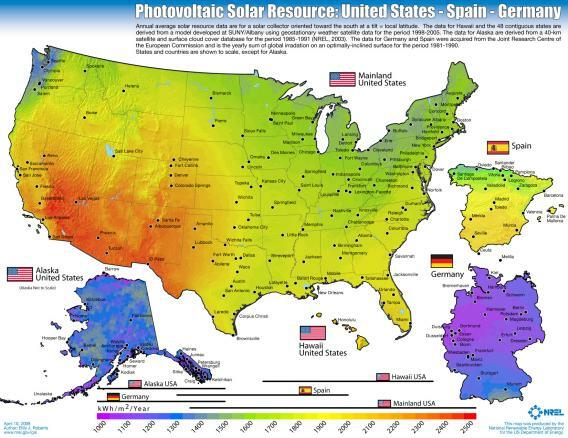 Germany has a solar resource similar to that of Alaska, but it blows away the per capita solar capacity installed in Florida. So don’t let gloomy weather get you down. Solar energy is completely viable in Florida despite the frequent clouds we see! If you want a demonstration of an actual solar energy system operating on a sunny versus a cloudy day, come see me! We have remote data monitoring available from hundreds of sites! Next Post: Can I Put Solar Panels on a Wall?